According to the calendar, summer has come to a close and we have officially made our way into “fall”, which, don’t get me wrong, I am READY for. But let’s be honest--just because Kroger slogged a pile of gourds out front and Starbucks is peddling their usual autumnal faire...that doesn’t necessarily mean it feels any different outside than it did in July. Still, I am not ashamed to admit that I happily fake it. I lovingly play pretend and light the waxy cinnamon candles and indulge in any/everything that could conjure the season to progress. So, with that in mind, we wanted to kick off October with a dessert that would satisfy everyone’s appetite for Fall while also cooling you off, because here in the W&B kitchen, we believe you should have your cake and eat it too. 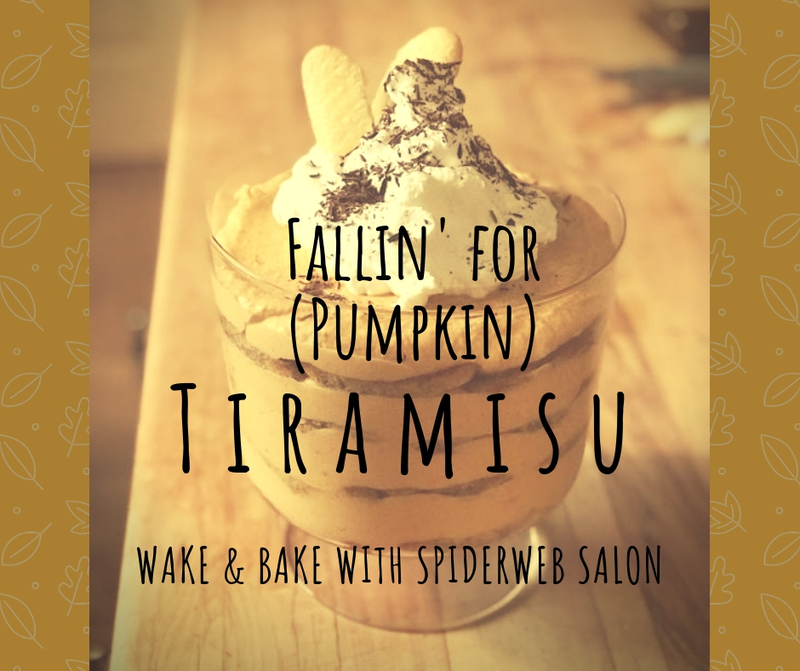 This week we bring you: Pumpkin Tiramisu! All the fall-fixin’s for our creamy, pumpkin-layered delight! Apart from being one of my all-time favorite desserts, I really didn’t know much about its origins. The charming Italian translation for Tiramisu means, “Cheer me up” or “Pick me up”. How perfect is that? After the long, sweaty summer, a cheerful pick-me-up feels well deserved! Like most incredible culinary dishes, there’s still much debate on when and where it came to be. Some believe it was formally introduced to modern society in the mid 1960’s, but others argue it was first created in the early 17th century to honour the Grand Duke of Tuscany! Either way--huge shout out to Italy. We dunked many a lady finger for this one. It was as if the Universe was nodding in happy agreement for our efforts, because the temperature outside fell to a cool, crisp 70 degrees when we got to Caitlin’s. This supports my long held belief that if you bake it, Fall will come. We bake to shift energy, we bake to bring about change, we bake to save lives! Summer be gone! We suited up and got down to business after consuming our usual gallon of coffee, but shortly into our session, we all looked at each other like, “Holy crap, this is a breeze!” Once we realized how simple and quick this was gonna be, we switched from coffee to booze and cracked open a couple different types of liqueur to “test” which would be better with the ladyfingers. This W&B session was probably one of the chillest hangs ever. I don’t even have to bore you with detailed tips or long winded instructions on this one. Quite literally, all you gotta do is mix up stuff in a bowl and layer it all in a trifle dish with some lady fingers + whipped cream. Not only that, but it looks SO beautiful and eye catching, people will think you spent a lot of time and energy making it. You won’t have to sweat over a hot oven for this AND guests will marvel at your culinary excellence. Win win! If you wanna be extra AF you *can* make your very own ladyfingers (we will be attempting this in a later post! ), but we just bought a few packs from the bakery section of the grocery store and toasted them for a few minutes to elevate the flavor. It’s seriously so hard to screw up this dessert that you could vigorously sip on coffee liqueur all morning long and still come out with a masterpiece….not that we would know anything about that…. The presentation is lovely but the taste is lovelier. Wow your autumn dinner party guests with this simple yet delicious pumpkin and coffee soaked masterpiece!